For other places with the same name, see Whitefish River (disambiguation). 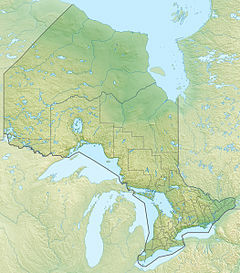 Location of the mouth of the Whitefish River in Ontario. The Whitefish River is a 45 km (28 mi) long river in Thunder Bay District in northwestern Ontario, Canada. It is in the Lake Superior drainage basin, is a tributary of the Kaministiquia River, and is in the centre of the Whitefish River Valley which is the location of several small settlements that grew along the Port Arthur, Duluth and Western Railway. The river begins at an unnamed lake in the Nolalu Local Service Board about 7 kilometres (4 mi) northeast of the community of Mackies, on Ontario Highway 588, and flows east to take in the left tributary North River. It continues northeast through the townships of Gillies, O'Connor and Oliver Paipoonge, and reaches its mouth at the Kaministiquia River, which empties into Thunder Bay on Lake Superior. "Whitefish River". Geographical Names Data Base. Natural Resources Canada. Retrieved 2010-08-18. "Topographic Map sheets 52A5, 52B8". Atlas of Canada. Natural Resources Canada. 2010-02-04. Retrieved 2010-08-18. This Northern Ontario geographical article is a stub. You can help Wikipedia by expanding it.